Give a loved one or yourself the gift of ultimate relaxation. We take the guesswork out of scheduling multiple services, by grouping them together to compliment one another and pamper our clients to the fullest. Scheduling one of our collections for your wedding party or birthday creates a unique experience you will be talking about for years. Isn’t time to celebrate to the fullest? 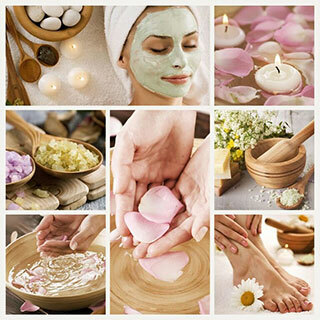 Transport yourself from head to toe to a respite of complete holistic relaxation for the skin and the senses. An all over body massage using warm lava stones and Shiatsu techniques stimulate energy flow and a special massage for the face and back relieve tension and induce deep relaxation. Includes facial, body, manicure, and pedicure. Devise your own spa experience to rebalance and replenish your body and mind. Be inspsired by choosing from any of our specialties. Capture the experience of one hour or one day – as little or as much as you desire. Treat yourself or someone special to a moment that results in a balance of life. Recharge, reconnect and replenish with the ultimate in total body nurturing. From the top of your head to the tips of your toes, let us transform you into the person you long to become. Spend a blissful day in a ONE on ONE respite provided to you by the most accomplished professionals in the area, utilizing the finest in skin, hair and body care. Your experience includes a Haircut and Style; Anti-Stress Hair and Scalp Treatment with Massage; ONE spa Manicure and Pedicure; European Balancer Facial; Lava Stone Shi Tao massage; and ONE spa lunch. The ONE collection that creates balance.